For help in finding a local teacher, call Lisa on 01296 317217 or email info@ebedcio.org.uk. The EBED Teachers Directory provides details of teachers who have agreed to share their contact information publicly. Alternatively, we recommend that you contact a bridge club near you. They will be pleased to provide information about their classes or give you the name of a teacher whom they can recommend. EBED promotes Bridge for All as the National Learning Programme. Do check whether your teacher is using the Bridge For All materials - and do ask for references from former students. • Beginning Bridge Book 1 - for those who want to learn using the ‘traditional’ method of a lesson once a week, for three terms. It progresses at a steady pace, allowing more time to digest each topic. • Fast Track Bridge - for those who want to learn more quickly, perhaps on a condensed course over a long weekend, or through a number of more intensive classes. It is designed to get you to the table quicker. • Continuing Bridge Book 2 covers more advanced topics, for those who have grasped the basics – whether having complete Book 1, or a Fast Track course – and wish to improve their game. • Practise Beginning Bridge Book 1 and Practise Continuing Bridge Book 2 help consolidate knowledge gained from our Bridge For All books. • A System Summary Card, which gives the Standard English system taught in the Bridge For All books in an easy to use reference format. There are many ways of learning bridge and much depends on the nature of the student and the dynamics of the group. 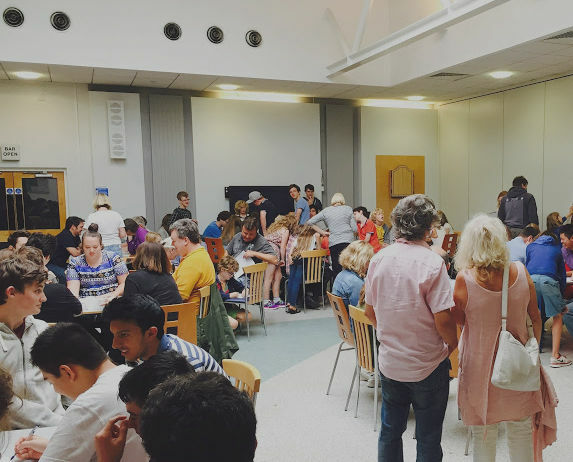 Some students will already be more familiar with bridge type card games (such as whist) and may in the early stages move faster than others – such students may therefore wish to consider a more accelerated course. Make sure that you talk to the teacher and check that the chemistry feels right. You should also look at the ideas given below before deciding the route which is best suited to you. If you are not familiar with how bridge is played then watch this video or this video for an overview. Learning the basics of bridge can be achieved comfortably over a weekend and you may well be ready for playing social bridge with just this introduction. Duplicate bridge takes a little longer and this really depends on the student. Learning bridge has been compared with learning a language in that reward is closely related to effort. And, just as everyone speaks a language (even if only their own), anyone can learn to play bridge. Whatever route you choose, becoming a regular player at your local bridge club will help you. If it seems a little hard at first, remember that bridge is, above all, meant to be fun - it is not an endurance programme. Clubs are always very keen to welcome new players and they may well have special sessions for players who are still learning. Be sure to ask the club secretary to help you find a session which will suit your level. For those whose schedule does not fit in with regular club duplicates, you can also play bridge online. Bridge4Free is a UK-based site offering free duplicate games day or night. Bridge Base Online is a big US site for playing, learning and watching bridge – and it too is free! Both Bridge4Free and BBO work a treat on an iPad or Android tablet. Click the links above to download their apps. Other on-line practice systems can greatly assist students, for example the V-Blue package available at a discount to students of EBTA teachers (see below). Regular classes don't suit everyone's schedule, so one option you might like to consider is going to a residential/weekend course or even take a cruise! There are many of these advertised in English Bridge, the EBU magazine. Past copies of English Bridge are available for free online. Finally, there are several independent companies who sell bridge courses and software. Please contact us for an up-to-date list of what we know to be available. Vu-Bridge offers many features for learning and development through the play of hands arranged by topic, quizzes, and more. It is suitable for both beginners and more advanced players alike. Please see www.vubridge.com for more information. EBTA Teachers and their students have access to V-Blue - part of the Vu-Bridge website - at discounted rates for students alongside EBTA lessons. Please ask an EBTA teacher for more details. EBTA teachers can find more details in the Teachers’ Zone. 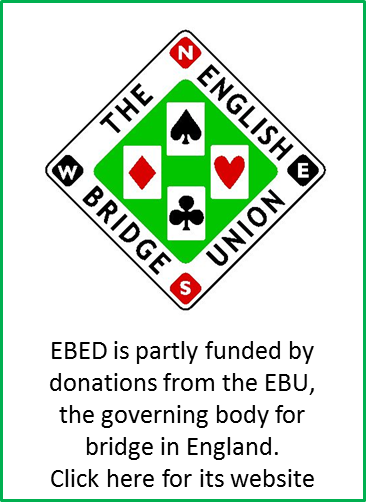 For further information about learning bridge, please contact us at info@ebedcio.org.uk or call Lisa on 01296 317217.